Peter Pan’s Flight is one of the most beloved Fantasyland attractions at Walt Disney World. While it is known as a classic, it has quite the interesting design and history, and was not always the same experience that we know and love today. What would it have been like if Peter Pan himself were not featured in the attraction? Read on to find out! Peter Pan’s Flight was one of the original Fantasyland attractions to open with the rest of Disneyland in 1955. Though numerous refurbishments have taken place in Fantasyland, Peter Pan’s Flight has remained almost entirely untouched, making it a truly classic Disneyland experience. 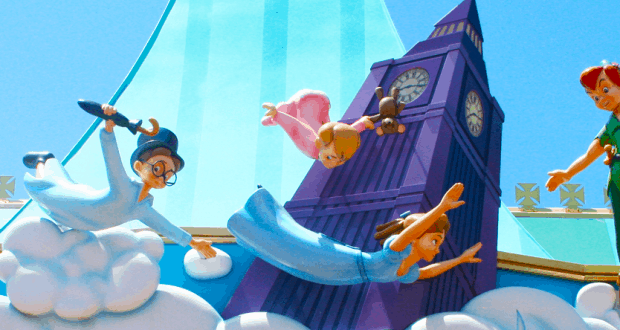 When Peter Pan’s Flight opened in Disneyland in 1955, the idea for the attraction was that guests would be flying from the perspective of Peter Pan. As such, he would not be featured in the attraction at all. This was confusing to guests, who flew over different scenes from the film. They wondered where the main character, and namesake for the movie, was. Peter was included in the ride when it made its debut in other Disney parks, however he was not seen in the Disneyland version until an audio animatronic of him was added during a refurbishment in 1983. At the highest, you are only about 17 feet off the ground while flying through the attraction. The forced perspective used on the effects below you can make you feel much higher. This is particularly true in the scenes where you are flying over London and first entering Neverland, as the size of the models below imply that you’re soaring at a much taller height. An Omnimover ride system basically means that the ride vehicles do not stop. Many Disney rides employ this system as it is a more efficient way of loading and unloading guests for the attraction. Instead of having each ride vehicle, or galleon, stop, guests walk along a moving walkway that goes the same speed as the vehicle while stepping inside. This system is implemented in a number of other Disney rides, including the Haunted Mansion. Omnimover systems generally make the load/unload process faster, however Peter Pan’s Flight is extremely popular and draws long waits regardless, so be sure to grab a FastPass. Since the ride’s original opening in Disneyland in 1955, it has been recreated for the Walt Disney World Resort in Orlando, FL, as well as Disneyland Paris, and Tokyo Disneyland. This classic dark ride attraction is beloved for its originality and timelessness in Disney parks around the world. Peter Pan’s Flight in Walt Disney World has not been substantially updated or changed since its opening in 1971. However it consistently has long wait times for guests. While there is no clear cut reason for this, I have a few speculations. One is simply that the ride is a classic. Children today know the story of Peter Pan, and therefore want to ride. Parents and grandparents are inclined to ride for the nostalgia factor of when they used to ride it as children themselves. As an attraction that the whole family can easily be interested in, it is no surprise that it is so popular. Another reason for its popularity may be due to the fact that the ride vehicles are suspended over the scenes rather than passing through them on a track. This makes the ride unique. Regardless of the reasoning, Peter Pan’s Flight is a classic Fantasyland attraction, that is not to be missed on your next visit to the parks. Brittany is a recent graduate of Saint Anselm College, where she earned her Bachelor of Arts degree in History. She has always had an interest in Disney history, and spends much of her time researching various topics within this subject area. In the Fall of 2014, she will be participating in the Disney College Program at the Walt Disney Resort as a Merchandise Intern. In Spring 2015, Brittany’s first print publication, Brittany Earns her Ears, will be released. The book will provide readers insight into life as a Disney College Program intern, and will essentially be a sequel to the popular Amber Earns her Ears.